At the office I so rarely visit I have a quote that I’ve printed and pinned to the wall. It comes from Rear Admiral Grace Hopper, who was a U.S. Naval officer and an early computer programmer (she developed the first compiler for turning source code into object code). Anyway, I said that “it’s easier to ask forgiveness than it is to get permission” should be added to our list. I was joking. But should I have been? I like Grace Hopper’s quote so much because, on the face of it, it’s about rebelliousness and lack of respect for authority. That’s typically someone’s immediate takeaway when they first read it, and those are qualities I like to pretend I have. Except I don’t, really – I pretty much do what I’m told. It’s been a good while since I printed that and first pinned it to the wall of my cube, though. I’ve gained some seniority in that time, and as I was thinking about this today it occurred to me that nobody really tells me what to do anymore. My leaders set direction, provide clarity around what’s important (and why) where necessary, provide guidance where I need it, and then they trust me to do whatever it is that I do. Dig just very slightly beyond the surface of Grace’s quote, and this is, I’m sure, exactly what she was talking about. 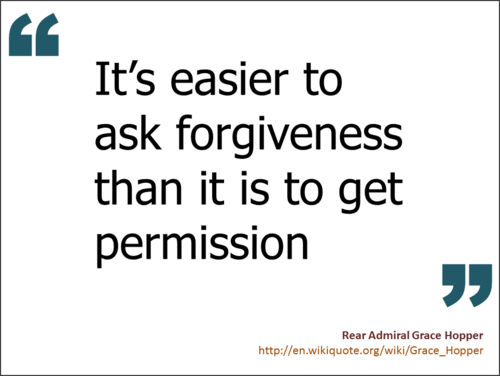 Grace was, after all, a senior military officer: I highly doubt she was advocating for a lack of respect for authority. What she’s talking about is ownership, and accountability. She’s saying that if you don’t have the necessary autonomy to demonstrate those qualities then that’s a problem so serious that you should be taking immediate action. If there’s red tape or dumb business rules that are a barrier to doing what you know to be the right thing then you absolutely need to be finding a way through it, and sooner rather than later. I think that’s something worthy of inclusion in any organization’s core values. I think at the time I thought I was joking about that too, and that little running joke is what led me to first put Grace’s quote up on the wall. Even if I did think it was a bit of a joke though I did endeavour to embody those words, and with the benefit of reflection it now seems as though I’ve advanced my career since then in part off the back of simply acting like I’m in charge of stuff. Interesting. Really though, this shouldn’t be surprising. My vocabulary has become more sophisticated in that time too: I now see more clearly that “acting like I’m in charge of stuff” is just a slightly tongue-in-cheek synonym for our theme of ownership and accountability. Once upon a time I used to wonder to myself why merely acting like I was in charge of stuff so often proved to be such a powerful tool in my toolbox. When you frame it in those more sophisticated terms the answer is clear. The reason it worked so well at my workplace is because we have a culture that recognizes, values and rewards leadership attributes like these no matter the level of the employee they come from. The question I should have been asking is why wasn’t it like that at previous companies I’ve worked for? Thankfully, the answer to that one doesn’t matter to me anymore.